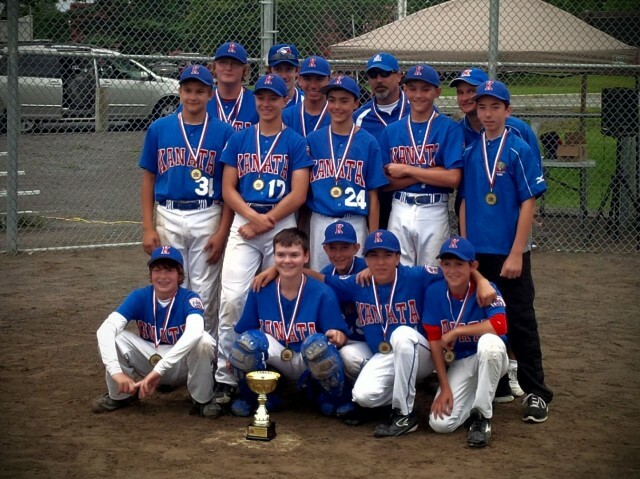 The Intermediate Kanata Cubs finished their season on a high this past weekend, winning the Kanata Capital Cup championship against Orleans 10-0. The team has been a great hitting team all season, and this weekend was no different – even playing all of their games in the rain! The boys hit seven home runs (only two against) through three games, with some personal hitting bests along the way – a walk-off Grand Slam from Mika Nikolai to win the first game against Orleans and Robert Downs’ first home run of the season in the second game against Ottawa West. Everyone contributed to this championship, from outstanding pitching to terrific fielding both infield and outfield, and some solid blocks by our catchers. The boys even turned a Pitcher, Catcher, 1B double play in the finals. Coach Lionel told the boys before the final game that it would be the last time they’d play together as a team and to give it their all – and they sure did, shutting Orleans out! The boys’ smiles say it all, capturing the spirit that led them all season. Congratulations, Intermediate Cubs!